Regional track shirts are now on sale for $15. Order will close Thursday at 6 PM. Click here to order! We have 20 kiddos qualified for the Regional Track Meet next weekend in Levelland, so please congratulate these kids when you see them. They have been doing some fantastic things! Go Cats! Congratulations to Vanessa D. on her acceptance to Angelo State University! Special thank you to all the Wildcats who helped raise $452.40 today during the pickle & popcorn sale for March of Dimes. 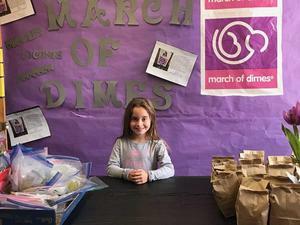 Second grader Sadie U. is the Ambassador for March of Dimes-Permian Basin. 4 Lifeguard classes will be offered at the Fitness Center this Spring and Summer. Contact: Deanna Titsworth @ 432-940-7857 for details. All participants must pass the swim test in preparation for the class. Congratulations to the JH Wildcats & Lady Cats! 8th Grade District Champions in Track & Field!! Congratulations to Malachi Torres on his acceptance to The University of Texas at San Antonio! Congratulations to Sydney Payne on her acceptance to Tarleton State University!